Shots aren't her cup of tea. You might not like to think about getting your furry bundle of joy stuck with a needle, but immunizations are essential for your pet’s health. Kittens need shots to protect them from some very serious diseases. Timing is important, so follow the schedule your vet gives you. Determining the right shots for your kitten can be a bit confusing. Part of the problem stems from the fact that there isn’t a single type of kitten shot, there are two. The first combines feline viral rhinotracheitis, calicivirus and panleukopenia into a single injection commonly known as the FVRCP vaccine. The second type is the RCCP, which protects against rhinotracheitis, chlamydia, calicivirus and panleukopenia. Your pet should get one or the other, but not both. Your vet can tell you which one is best for your fuzzy baby. 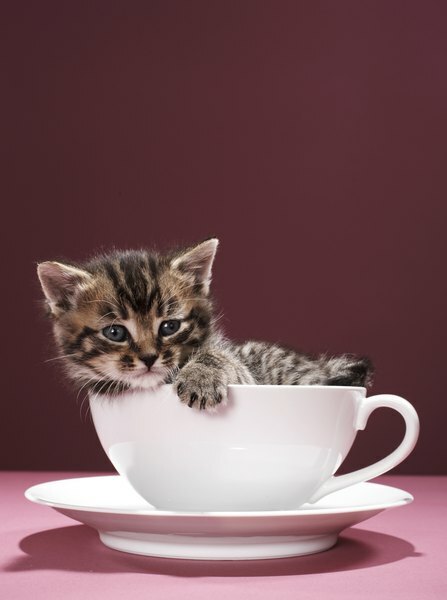 Natural immunity to disease passes to kittens through their mother’s milk. Before many weeks, though, this protection begins to fade. There’s no set time when the protection is gone, but it can be as early as six weeks. A variety of factors like birth order and how much each kitten was able to nurse will affect the timing -- so even within a single litter the kittens will lose immunity at different times. Since vaccinations don’t do a bit of good until mom’s immunity is gone, the standard solution is to give them a series of injections to make sure they get it when they need it. Kittens should get their first immunizations when they are between 6 and 8 weeks old. They should have either an FVRCP or an RCCP injection at a minimum; in some cases your kitty might need other shots, too. Your vet can recommend specific vaccines for your kitten based on how likely your little one is to be exposed to other feline diseases. Some of the shots your vet might suggest protect her against things like bordetella and feline leukemia virus. After the first injection, your kitten will probably need a booster shot to make sure she’s covered when her initial immunity wears off. When your kitten is a bit older, it'll be time for a rabies shot. A rabies shot is usually administered when little Kittie is around 4 months old. She’ll have to get a booster shot a year later. From then on, her vaccination schedule will depend on the types of vaccines she gets. Most of the time she can get a rabies booster every three years after the first year, but in some cases she’ll need it annually instead. You vet will let you know when to bring your kitty back.